"I would definitely come again and again and again..."; "I don't want to leave!" In this section you can read our students' reviews about their study experience at BAU International Academy of Rome. Studying in the amazing city of Rome was an incomparable experience for me. I have explored one of the most stunning archeological sites of the world, combining classic beauty with romance and lifestyle. Now I can tell you that in Italy pizza with zucchini and cheese tastes dramatically different from pizza with tomatoes and burrata. Taste is in the details, like God, and if you are not willing to invest some quality time in ensuring its presence in your life, you might never come across it. Before this course photography used to be all about shooting selfies or vacations pictures to share on my social media. Now, as a student of Business Administration, I can understand better the extent to which the photographer is a storyteller and images are a powerful tool to reach your audience by touching their emotions with your point of view. My best pic is the one showing the stairs of Piazza Trilussa, a well known meeting point for the city youngsters, but I also love my photo showing a detail of an Italian door handle, symbol of the Italian craftmanship. With this course I have had the opportunity to explore the neighborhood of Trastevere in Rome through the 20mm lens of a professional camera. The distortion can be dramatic and leads to a new discovery with each shot. I have pushed myself outside my still life comfort zone and focused on capturing people and the energy of a place. The series of photos I took with the bubble-blower were a real turning point for me. Now I am inspired and returning to Berlin with a newfound love for street photography. The unfamiliar camera and new focus on people and action have brought a visual experience that has enhanced the richness of Trastevere. I think that it is more profound because of the time it takes and the extrasensory awareness that is demanded. 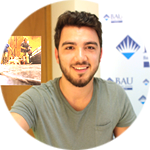 I am a student of Law at Bahcesehir University in Istanbul and by studying Filmmaking at BAU International Academy of Rome I have learnt that it's all about your viewpoint: a better position from which you can see the world helps you shape your life better! At BAU International Academy of Rome I have learnt by doing! It was amazing to explore the city, its architecture, culture, art and beauty, compare this experience with the main movies representing Rome and then learn how to reproduce all of this with filming, how to create viral videos, how to successfully advertise your brand by using word of mouth and the power of images! The session that I have spent at BAU International Academy of Rome is the last step of my undergraduate studies. What an amazing end! I have learnt here that if you can use your camera as an extension of your eyes, you can see later unseen details of the world. During my stay at BAU International Academy of Rome, I have discovered so many things about the city and the culture of Rome, that if I should put them in a bag and fly back to Istanbul, for sure I would have to pay hundreds kilos of extra luggage! The course of Cinematic Rome was amazing, I acted in a video for the very first time and I learnt how to shoot a documentary, edit, delete unnecessary parts, string together discontinuous shots and add voiceover behind filming. Nowadays, visual arts and videos are of outmost importance to communicate whatever in an effective way and this is what I have learnt starting from scratch, with the streets and monuments of the Eternal City providing an exceptional background and stage for my learning. The neighborhood of Trastevere will stand the test of time forever and the effort to convey this true sense of timelessness has been the objective of the amazing pictures that I succeeded to shoot thanks to this course at BAU International Academy of Rome! I had the experience of watching a group of nuns enter the Santa Cecilia church and sing; it seemed as if not a day had passed for centuries, the atmosphere, the sound and the unique sense of peace and eternity that I felt in that moment is what I hope to have captured in the shot I consider my best postcard of the Eternal City. The way you take a pic affects how it looks and how people perceive it... this is the simple but amazing learning outcome of my course of photography in the Cinematic Rome! It's all about your point of view and I have learnt here to divide the frame into thirds and then use vertical and horizontal lines to set an area for your point of interest. To master this new technique, I have been taking landscape and portraits pictures and learnt how to create a story by playing with side, front and back light and shadows casted on the object of your picture. Before this course I was a man walking with a camera, now I can walk with the ability to tell a story through the lenses of my camera. Can I take Viral Marketing and Cinematic Rome again? I don't want to leave! In five days I have learnt how to use a professional camera and design a flyer! I am so proud of the Rome postcards I have shot on my own, this is quite a result for a business administration student like me, starting from scratch. I will never forget my experience at BAU International Academy of Rome. Now I have learnt the impact of perspective on bad and good looking! Shooting Rome under the supervision of my BAU International Academy of Rome professors taught me many amazing things: above all the importance to have a point of view and the stunning beauty of the Eternal City. It has been very instructive for me to learn from the direct experience of an Art Director the powerful link between visuals and business, in an era where you have limited time to catch people attention and the ability to engage your audience with your storytelling skills is of critical importance. During my Global Politics and International Relations Master’s program, I had the opportunity to analyze global political system from different perspectives. The program is completely designed towards gaining a vision and understanding of global security, historic, institutional and strategic development of international politics, and the global system in addition to practical and theoretical knowledge. This program’s critical success factors are the global perspective and approach of the program as well as the valuable academic staff well-joined with the professional politicians. All together, these factors gave me the ability to become aware of different insights and experiences on global and national politics, and the opportunity to have a chance to join international field studies on different applied research areas. It was a pleasure for me to be a part of this program and meeting all the people whom I’ll be in touch with for the rest of my life. BAU Executive MBA program is truly a personal and professional growth experience, an opportunity to step out of day-to-day life and focus on learning, networking and expanding your own horizon. My fellow students brought a tremendous amount of experiences from a wide range of industries and the professors are the foremost in their fields. The nature of the coursework, study groups, activities and individual conversations along the way allowed me to push myself and maximize my future contributions at workplace. It has more than lived up to my expectations and visit at the Silicon Valley was the most thrilling and unique part of this program for me. Studying abroad in Rome was a life changing experience. I studied Architecture at BAU International Academy of Rome; everybody was incredibly helpful and made the process less stressful and overwhelming, especially when I met Francesca De Palo, the Director at BAU Rome campus. It is located in the heart of Rome, a place where you can taste the real culture and atmosphere of the Italian people. Attending class at BAU International Academy of Rome was also a very worthwhile experience for me. It is one of the most prestigious universities in the world, especially in the Architecture field. My semester was really successful, full of knowledge and great experiences. My Architecture Design project “Versace Headquarters” won the first Consul Prize for Made in Italy Brand. The prizes were given by big famous designers and architects such as Anna Fendi, Icham Benmbarek, Pino Tedesco, Tina Vannini, Luca Curci, Hicran Topcu and many more. Director Francesca De Palo got me a perfect offer for an internship, after that great success and the semester was finished. So I had an interview for an architecture internship with S.B. ARCH. BARGONE ASSOCIATI - “Studio Bargone”, an architectural studio with offices in Rome and Foligno, founded in 2002 by Federico Bargone. I was accepted and I learned a lot from this studio. I was so glad and proud that I met all of these people. We joined an architecture competition, a museum complex in South Korea. How important my time abroad was to me is something that I cannot express enough. It was truly an experience of a lifetime. After 30 years of professional experience that became my career, I started my postgraduate degree as a skeptic. I thought that there was nothing more this degree could contribute to my understanding and work. However, I quickly realized that I was wrong to think so after my first lecture. Bahcesehir University’s Graduate School of Social Sciences with its excellent organization, communication, lecturer choices has executed the program without a missing piece. In the classroom, the professors have been most helpful, kind and rewarding since they have always been open to discussion, up to date with the examples they have used and academically enriching my perspective on the subject. On the other hand, the administrative staff at the Graduate School of Social Sciences have been the most careful and rigorous with me and have immensely eased my time during my post-graduate degree. Bahçeşehir University is one and only university that has international campuses in several countries. As an I am engineering student, my abroad faculty was established in Rome, Italy. Thanks to my professors in Rome and especially my supervisor Mrs. Francesca my Italy adventure passed amazingly well. I experienced many things Italy. Amazed with cultural richness of Rome, educated with deep knowledge of my professors, observed many industries and experienced working life in Italy. After one semester in Rome, with the help and guidance of my supervisor Mrs. Francesca I started my internship in IIT (Istituto Italiano di Tecnologia) as a guest student. This experience gained me unequaled opportunities. IIT is a new established foundation that hosts many advanced technological departments inside of it. IIT is one of the leading technological institutes in Europe, also the prestige of IIT is getting increased all around the world day by day. Working in IIT changed my point of view and enlarged my knowledge. I had and chance to see and observe Humanoids in here. The biggest and most developed humanoid in IIT named as Walk-Man. Walk-Man is 120 kg weighted and 185 cm tall guy. Everything in IIT is directly my interest area so, I settled a goal to myself. This goal was learning something new in every day in IIT. I think, I achieved my goal. In IIT my working department was Human-Robot Interfaces and Physical Interaction which is established under the Advanced Robotics Department. I worked on project called “ErgoTac”. This project aims to develop a wearable and lightweight feedback device to inform the human about excessive joint torques while collaborating and physically interacting with robots. This is to avoid potential injuries as results of continuous overloading of the lower back, shoulder, elbow and ankle joints, a very common cause of injury in several industrial applications. With this work, I am going to have chance to have “paper” in the Bachelor’s Degree. Seeing my name in the same paper with the very valuable scientists will be great honor for me. Also, this is a very big and advantageous step for my academic career. I spent lots of my time in the robotics activities. So, atmosphere in IIT was very familiar for me. But there is a very important thing that I must mention about. The most important experience that I had in IIT is feeling what being scientist is. This experience totally changed my path. Now, I am going to work for science and being scientist. For giving such a great chance and taking care of our main interests, many thanks for Mrs. Francesca de Palo who is the director of BAU Rome.